Creating a dramatic mood through décor is the goal of every Event Dynamics occasion. 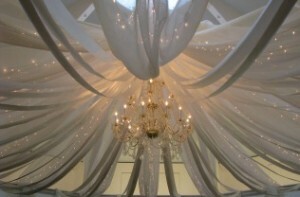 We will design your event décor using drape or a wide variety of fabrics. In crème or black, drapes can add elegance to a wall, section off a room, or provide a custom backdrop for a band, head table, sweetheart table, or wedding cake. Crystal organza curtains highlighted with the glow of white twinkle lights add that romantic feeling to an evening event whether it be inside or outside in a tent. In addition, Event Dynamics can add custom platforms to create a stage at any room or tent event. Whatever it is that you imagine as that striking atmosphere for your special event, Event Dynamics will help you design so that your event is truly “once in a lifetime”.